Several years ago, my husband and I visited Europe. We decided to do it on the cheap, so we stayed in hostels, travelled by Eurail, and carried all our belongings in our backpacks. It wasn't the most leisurely trip we've ever taken — we spent an awful lot of time cold and tired. But I'm grateful we were able to experience the things we did. The one thing I did make room for, though, was a wood-carved wine bottle stopper from a small town we visited in Switzerland. It's a little guy with a lever on his back, which, when pressed, causes him to raise his wine jug to his opening mouth. I don't have a lot of use for a wine bottle stopper, mind you. But every time I looked at him, I smiled. So I bought him. He still sits on my shelf, reminding me of our trip... and reminding me that making someone smile is a worthy goal for a maker. Ever since then, I've been intrigued with the possibility of making moving things with polymer clay: mobiles, toys, bobble heads, etc. It's one of those ideas I'm eager to explore... but I haven't settled down and devoted my energies to it yet. 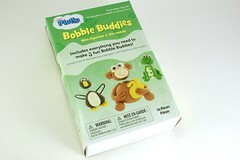 So I was especially excited to see that Polyform had created a Pluffy Bobble Buddies kit, including all the supplies to make 3 bobble head figurines. Sam celebrated his second birthday a couple of weeks ago. The occasional tantrum and two-year-old stubborn streak aside, we're having a great time. As he grows and develops his own personality, we find ourselves enjoying him more and more. But I've gotta admit something. If you looked at his baby book, you'd think he was still 3 months old. That is, if you could find his baby book. I know generally which closet it's in... but I haven't actually seen it since, well, who knows when. I know I should be keeping track of the important things... and I do have various notes and photos. They're just spread out on Twitter, Facebook, Flickr, and a couple of different hard drives. I've always had a mental block against scrapbooking — I think because I hate to commit my memories to embellishment & paper styles that will so quickly look outdated. I just assumed that some maternal instinct would take over and I'd become queen of the baby book. But that hasn't happened. So I was kind of proud of myself for remembering to buy (and use!) the Sculpey Keepsake Clay Frame Kit on Sam's 2nd birthday. 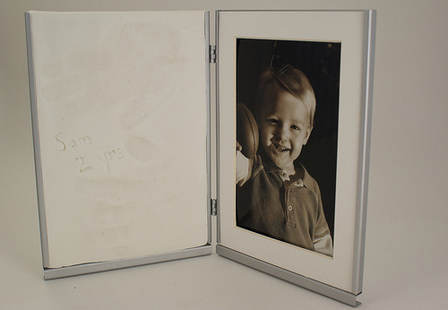 By golly, we may not know what happened between months 3 and 24, but we do have his 2-year-old hand prints preserved for all time. I'm hoping that counts for something. Maternal pride (such as it is) aside, I wanted to share my thoughts on this kit for any of you who might be considering using it with your little ones. A couple of posts back, I shared my thoughts on Pluffy Clay — a clay that's marketed for kids but also has some potential uses in a clayer's studio. Now I want to talk about a couple of Polyform's other "for kids" products. I'm reviewing them from a clayer's perspective — things I think they do well or could improve on. Since my little one's not quite old enough to help me review these, I'm having to guess about what the kiddos would and wouldn't like. If you've tried any of these products with your own kids or grandkids, I hope you'll add your experiences in the comments. 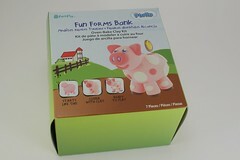 As I mentioned in my previous review, the Pluffy clay I tried was part of the Firefly Pluffy Fun Forms Piggy Bank Polyform sent me a while back. Unfortunately I got caught up in book-related things and didn't review this kit when I should have — and it's possible they've discontinued it in the meantime. (It is no longer listed on Polyform's site.) It's still available in my Michael's, though, so check on the clay aisle there if you're interested. I first came across Zentangles a couple of years back while browsing through Swap-Bot's Artist Trading Card listings. I was intrigued by these very bold, very artistic pieces, and I wanted to learn more. However, the only resource available at the time was the fairly expensive Zentangle Kit. I put it on my Christmas list hoping that a wealthy benefactor would adopt me... or that I'd win one of those get-everything-on-your-gift-list sweepstakes. Unfortunately neither happened, and the Zentangle kit stayed right there on the wish list. So I was pretty excited earlier this year when I learned that Suzanne McNeill had published several very-affordable Zentangle books. For less than $10 per book, you can learn about the Zentangle method, practice quite a few introductory "tangles," and explore some of the possible applications. 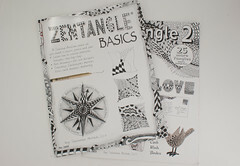 While there are three books (Zentangle 3 combines Zentangle-ing and rubber stamping), I'm going to focus my review on the first two: Zentangle Basics and Zentangle 2 . You probably don't even need to buy both of those... but more on that later. I'm not a huge jewelry person... but when I do wear jewelry, I'm hopelessly matchy-matchy. I love to have earrings that match the necklace. Bonus if there's a matching bracelet, too. It affects me to the point that, even if I absolutely love a necklace in my jewelry box, if I don't have the perfect earrings for it, I find myself not wearing it. I have to admit, I got interested in Yukiko Miyai's Clay Art for Special Occasions before I realized it was intended for use with air dry clay; otherwise, I might not have chosen it. Air dry clay doesn't appeal to me for the same reasons metal clay doesn't. I'm spoiled by polymer clay. I don't like having to re-train myself to work quickly, use damp cloths, and store excess clay in airtight containers to prevent it from drying out. I tend not to think it's worth the extra effort. But the author's mother developed Claycraft by Deco, the specific air-dried modeling clay recommended throughout the book. As a result, that brand of clay and all the related accessories are pretty ingrained in the book. Still, I hoped that the principles would apply to oven-bake polymer clays, and if they didn't, I'd been meaning to give air dry clay another try anyway. So I continued reading and trying projects despite initially not having the "correct" clays and tools (with varied results... but more on that later). One of the products I used in the article — and have found myself using more often lately — is Studio by Sculpey's Satin Glaze . Polyform sent me a bottle to try, and I have to say I was initially skeptical. I had bought some Sculpey glaze years ago and remembered it being thick and gunky and practically unusable. I wasn't expecting other glazes from them to be significantly different. My husband bought our Halloween candy too early again this year — so early, in fact, that we had to buy another bag by the time Halloween actually rolled around. And as luck would have it, we had fewer trick-or-treaters than normal. So now there's post-Halloween candy calling our names, too. Between Halloween leftovers and the temptations of the coming Thanksgiving and Christmas holidays, this time of year can be a dieter's worst nightmare. But those same temptations make the holidays a foodie's delight. 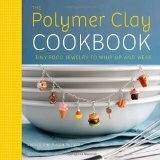 And if you're a foodie, then The Polymer Clay Cookbook: Tiny Food Jewelry to Whip Up and Wear by Jessica and Susan Partain may be just the book for you. As the authors say in the intro, "to celebrate food is, we think, to celebrate life." This book celebrates miniature polymer clay food jewelry, and it serves up the how-tos with a generous helping of food-related memories. The authors even sprinkle in a few edible recipes for good measure. Ever since I saw my first calaveras at a local Mexican restaurant, I've been intrigued by Dia de los Muertos, or "Day of the Dead." Celebrated throughout Mexico at the beginning of November, the holiday takes a festive approach to death. Families remember loved ones who have passed away through personalized altars, parties, and picnics. The belief is that, as long as a person is remembered, they never truly die. The calaveras (decorated skeletons) that adorn the holiday have a humorous look, not spooky like Halloween skeletons. They're more like caricatures of the person, featuring clothes and hobbies that the person enjoyed. I think it's a neat way to celebrate the lives of those lost. Since I've been wanting to try making Dia de los Muertos crafts using polymer clay, I was a little surprised to find that there's a book featuring both things... and it's been out more than a year! 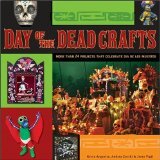 Day of the Dead Crafts by Kerry Arquette, Andrea Zocchi & Jerry Vigil, is a fun and crafty introduction to the imagery of this holiday. The book starts with a history of the Dia de los Muertos holiday, which dates back to the Aztec Indians and evolved over time. The intro also talks about the meaning behind the various symbols. I like the personal emphasis: it's folk art, so it's okay for it to be raw. There is no right or wrong ways to create these pieces. The book includes tons of examples of different styles of work. I love that these examples are great for sparking new ideas. However, the photos are mostly from a Hollywood festival. I would like to see more photos from Mexico to get a more authentic sense of the holiday. Seems like we all have our little autumn traditions. Lisa Clarke makes her First Day of Fall Pumpkin Bread. I've mentioned my candy corn tradition here before. But another sure sign it's fall is when I start searching the trees for leaves that are still in good enough condition to make leaf impressions in polymer clay. See, leaf impressions were one of the first projects that got me hooked on polymer clay. I love the tiny detail lines you can get by pressing a real leaf into polymer clay. But the urge to make these leaves doesn't come until fall for me... just about the time good leaves are getting difficult to find. And there's only a certain number of times you can pick leaves off the neighbor's tree before they start looking at you funny. 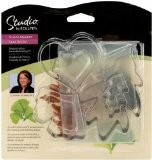 So I was really excited when I won the Studio by Sculpey Shape Makers Leaf Set IV at the IPCA Retreat. I wondered if this would give me an easy way to make polymer clay leaves even after leaf season was over. I'm gonna let you in on a little secret. As the treasurer for my local polymer clay guild, I am responsible for ordering the books we select for our library. I am not, however, the librarian... so theoretically I'm supposed to order the books and have them shipped to the librarian. And that's usually what happens. But occasionally, I'll have the books take a little detour. If it's a book I'm eager to get my hands on, I'll have it shipped to my house for a quick review, then I'll deliver it to the librarian. When the book arrived, I eagerly jumped in, starting with the foreword by Cynthia Tinapple. "You may think you'll never 'get' color the way Lindly and Maggie do," it starts, "but don't let the weight and complexity of this book fool you." It was at that moment that I first took a look at the weight and complexity of the book. I began to realize what I was in for. This was not a book I could read through in a couple of days, cherry-pick a few exercises to do, and write a quick review. This was a textbook that would require in-depth study and intensive lab work. And it was a book I'd probably want to keep for reference. The next day I ordered my own copy and started my first long read through the book. I'll be honest with you. 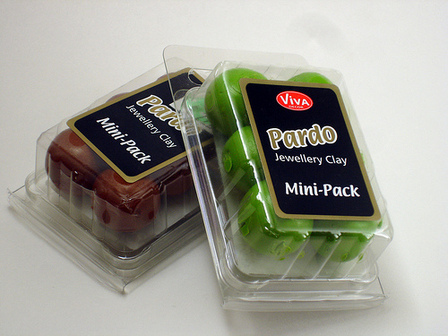 I've had a packet of Peridot-colored Pardo Jewellery Clay sitting on my desk ever since the IPCA Retreat in July, just waiting for me to dig in and try it. Actually it sat on my desk a few weeks, then got demoted to my desk drawer, then to my storage cabinet. I usually enjoy trying out new clays, so even I was surprised when my guild members asked me about it, and I remembered I hadn't even opened the package. My reluctance to review it here stemmed from two things. First, the cost. The Pardo clay is significantly more expensive than the brands we've already got. Second, I felt that the manufacturer was doing a really poor job with their distribution of the clay. They initially listed a contact person at one U.S. company, but I never got a response despite sending multiple emails. The primary U.S. supplier seemed to be having a hard time getting shipments in to fill her orders. So I didn't feel like it was important to review a product that was overly expensive and difficult for the average clayer to get their hands on. BUT when I saw that my local Hobby Lobby was now offering it alongside their other polymer clays, I figured I ought to give it a try. In case you haven't heard of it yet, Pardo clay is made by Viva Decor, a company in Germany. They have 70 colors, including many metallics and colors with glitter inclusions. Since it's a jewelry clay, most of their color names are based on precious metals and gemstones. A unique feature about the clay is that it includes beeswax as one of its ingredients. The clay is sold in 2 sizes: a 2.7 oz. jar and a 1.2 oz. mini-pack. Occasionally (usually by accident) I'll read a craft book that focuses on the artist's process. These books are always full of beautiful photos of the artist's work, with the artist sharing what inspired them and why they made the choices they did. While it can be worthwhile to read about another artist's process, I'm usually disappointed with these books... often because of a misleading title. For example, I read Secrets of Rusty Things: Transforming Found Objects into Art a couple of months ago. I went into the book thinking I was going to learn how to make art with rusty old found objects. It made me sad when I found out it was just about one particular artist and a few of the specific art pieces he made. So when I heard about Robert Dancik's new book, Amulets and Talismans: Simple Techniques for Creating Meaningful Jewelry , I was cautiously excited. I worried this was going to be another misleading title, that I really wouldn't learn about making meaningful jewelry. Happily I was wrong. This book's step-by-step instructions are used alongside the author's artwork and stories to help capture both the techniques and the spirit behind the art. I have a long checklist of things that I take with me when I'm crafting away from home, including, among other things, clay, clay tools, TLS, rubbing alcohol, baby wipes, and the big one... the pasta machine. Most of the stuff can be grabbed and tossed into my bag fairly easily. But the pasta machine requires unclamping and disassembling, and then getting it back just right whenever I get home. When I was just going to my monthly polymer clay guild meetings, it wasn't a big deal. I'd allow myself an extra half an hour to pack up my stuff, and it worked fine. Then some friends of mine started a monthly Downtown DIY craft night. Add on the occasional class, and it started to feel like I was spending more time packing and unpacking my pasta machine than actually using it. And for some reason, it's a little harder to get out the door nowadays than it was, say, 6 months ago. So I decided I wanted a second set-up: a basic set of tools I could leave packed up and ready to take. I had duplicates of some tools, and a few older tools I didn't use often at home but would be happy enough with at a meeting. 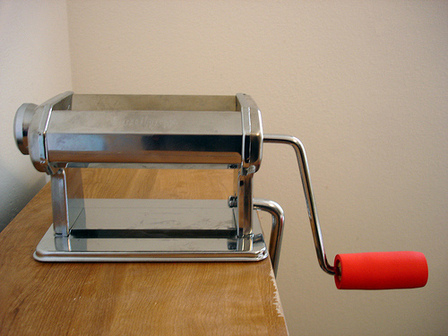 But a second pasta machine seemed like a real splurge. I've been using my Atlas 150 for almost 10 years now, and it's served me well. But I got it back when the good ones were cheap on eBay... there weren't nearly as many polymer clayers to compete with on the bidding. And since some of the newer Atlas machines have scraper problems, I don't feel entirely comfortable buying one online anyway. I'd want to inspect it. I learned at the IPCA Retreat that there's a new Sculpey pasta machine, er rather a "Clay Conditioning Machine" (it's about impossible for me to call it anything but a pasta machine!). It's cheaper new than I'd pay for a used Atlas on eBay, so I decided I'd give it a try. After all, it seems like a machine made for clay stands a fair shot at working just as well with clay (or better) than a machine made for pasta. 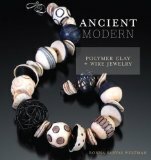 While I'm sure Ronna Sarvas Weltman didn't write Ancient Modern: Polymer Clay + Wire Jewelry in a month, there's still something about it that reminds me of NaNoWriMo. But more on that in a minute. Polyform recently announced their new Bake Shop Clay. 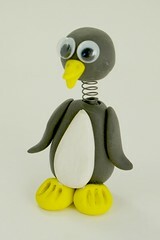 It's a part of the Sculpey line and is marketed towards school-age children. 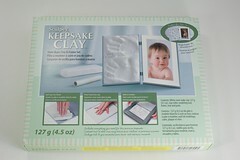 And while serious polymer clay artists and crafters may not be interested in this clay, many polymer clayers also clay with little ones who might be interested in it. So here's my impressions, along with the impressions of 5 little clayers. Bake Shop clay is non-toxic, lead-free, and phthalate-free. (Interestingly enough, when I asked about the phthlates in their other clays, Polyform's Education Manager Iris Weiss said, "All of our clays comply to Prop 65, almost all are phthalate-free, all of our children’s products are definitely phthalate-free.") 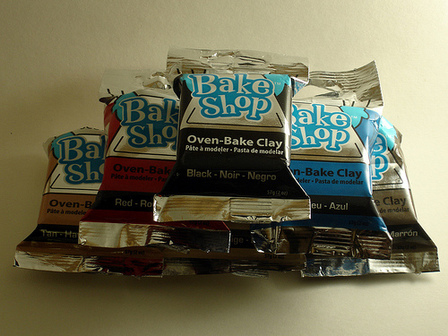 Bake Shop is sold in individual 2-ounce packets, or in a multi-color sampler pack. Colors include: Red, Orange, Yellow, Green, Blue, Purple, White, Brown, Black, Beige, Hot Pink and Tan. The Polyform folks are marketing this to kids, not polymer clay artisans, although they point out that they "have seen masterpieces created from Original Sculpey." Good point. So even though I'm not their target audience, I wanted to give the clay a test run myself. I occasionally watch decorator shows on HGTV, with the hope that one of these days I'll apply their lessons and spruce up my surroundings. One of the shows Tivo faithfully records for me is Sensible Chic, where they take a high-end designer room and recreate it "at a fraction of the cost." That's kind of what Cris Dupouy's Creating Your Own Jewelry: Taking Inspiration from Museum Masterpieces does. Dupouy gives instructions for re-creating 35 museum-inspired jewelry pieces, using polymer clay, semi-precious stones, acrylic paint, and a few jewelry findings. Drawing her inspiration from as far back as the 7th century B.C., Dupouy uses both actual jewelry pieces and jewelry shown in paintings. Each of the projects starts with a photo and the history of the original piece. This is a nice touch, and would make the book enjoyable for art history buffs. 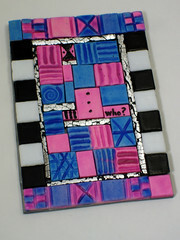 (Art lovers would also enjoy Sue Heaser's Polymer Clay Mosaics , reviewed here, for the same reason.) It made me realize how little I've paid attention to the jewelry in artwork — even the paintings I was familiar with, I hadn't noticed their jewelry. There's a lot of possibilities for inspiration there, far beyond the museum pieces that are in this book. It's hard to believe it's been almost 10 years since I stumbled upon polymer clay. Hubby and I were on vacation, and I saw the Klutz books Incredible Clay Book and Create Anything With Clay in a toy store. I quickly realized polymer clay wasn't just for kids and fell in love with it. But when I went looking online for more information, I didn't find much. Polymer Clay Central was about it back then. So I spent hours working through various of their tutorials, trying to figure out what to do with this new and amazing material. And I clearly remember one of those tutorials was Dinko Tilov's How to Make a Bird with Teeth. Dinko Tilov is still working with clay, and after a successful first book, he has teamed up with his brother Boris to write another. 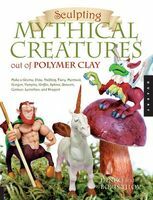 Their new book, Sculpting Mythical Creatures out of Polymer Clay (Quarry Books 2009), includes instructions for making 13 different creatures. I'm always trying to improve my blog, so I keep an eye on sites like ProBlogger. There are lots of good suggestions there. But it's like many other blogging tips sites in that much of what it says works best for technology or newsy blogs. Craft blogs have some special challenges that you don't see addressed very often. A few months back, "Sister" Diane Gilleland of CraftyPod mentioned that she taught a class on craft blogging. I shot off an email asking if her class was available online... but alas, it was only a Portland thing. While that's an area of the country I'd love to visit sometime, it seemed like a bit too much of a commute just to take a class. So I was very excited Friday when Sister Diane announced she had written an ebook on that very topic. "Making a Great Blog: A Guide for Creative People" is available on her site for $12.50, and it's specifically geared towards arts & craft bloggers. The 49-page ebook covers the why and how of starting a blog, tips for making it pretty, and a primer on blogging etiquette. While the ebook is geared towards the beginner blogger, I did find it useful. I especially liked the section on photography, which included a few tips on props I'd never considered before. I like that she encouraged folks to first figure out why they want a blog and what their goals are. Having a goal in mind always helps focus a new project. I'm glad she talks about getting permission when using others' photos. And I liked her worksheets. I plan to go through some of the exercises just to make sure my blog is still moving me towards my goals. I'm generally not crazy about ebooks, but this one was well-formatted and easy to read. It seemed a little expensive to me... but then again, it's much cheaper than buying a flight to Portland to attend her class in person! So I guess I can't complain much. If you're just getting started (or just thinking about it) in blogging and need some guidance, I would highly recommend Sister Diane's ebook (buy it here). You may also want to keep an eye out for parts 2 and 3, "How to Promote Your Creative Blog" and "Creative Blogging 102," due out this summer. If you've been blogging for a while and are already an expert, you might be more interested in ProBlogger's free 31 Days to Build a Better Blog program. The nice thing about ProBlogger's Darren Rowse is that he focuses on blogging as a way to bring value to the reader. Good content is most important, not search engine hacks or other tricks. I recently started the 31 Days to Build a Better Blog program, and I feel like it's helping me improve my blog. Finally, if you don't need any help with your blog, you might be more interested in tips for better microblogging (aka Twitter). This list of 9 Twitter Tips for Artists has a few things I don't agree with (like retweeting everything you think is funny). But it makes up for that by its suggestion to limit your self-promotion (a common mistake for new artists on Twitter). Overall it's a good read if you're considering Twitter-ing. Christi Friesen has built up quite a following. If you hang around polymer clayers for long, you're bound to meet some of her die-hard fans. Ya know, the ones who have all her books , take her classes, frequent her website, AND participate in her Yahoo group. I like Friesen's humorous writing style. And I love her attitude towards making and selling things inspired by her works — one of the most generous artists in polymer clay from that standpoint. 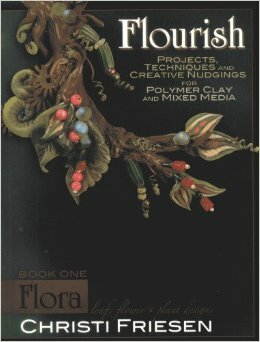 Polymer Clay and Mixed Media— Together at Last is the first of Friesen's books I've really read. 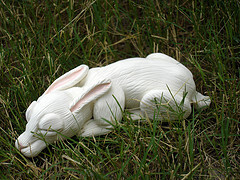 Sue Heaser is one of my favorite polymer clay authors. Her books are always full of interesting techniques and projects, and they're well-illustrated with helpful photos. On top of that, I love the way she suggests related ideas — helping the readers take the next step and brainstorm a project of their own. I usually finish her books inspired, with a whole list of new things to try. Her books aren't always the easiest to find, though. Heaser is from England, so most of her books were published originally there. (There may even be a few that were published only there.) Many of her books are out of print and can be expensive if you do find them secondhand. Shiny metallic and glasslike finishes all have their place. But sometimes you want an older, more weathered look. I recently experimented with using the Rust Antiquing Set by Sophisticated Finishes on polymer clay, and I wanted to share my experiences. The Rust Antiquing Set doesn't just create the illusion of a rusted finish — it actually creates a metallic, rusted top layer on whatever surface you paint it on. The set comes with two bottles. 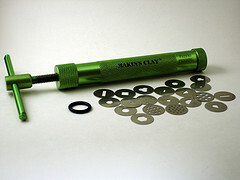 The Iron Metallic Surfacer paint includes real metallic bits. You paint this on first to create a rust-able surface. Then you use the Rust Antiquing Solution to rust those metallic bits. I was pleasantly surprised the other day when I found out my local Hobby Lobby has started carrying Studio by Sculpey products. Since I no longer have to order online and pay shipping, it seemed like a good time to give their Super Slicer blades a try. I've only ever had the one rigid clay blade, and it's gotten pretty dull with years of use, so I wanted to replace it. Plus, since I've never had a flexible, wavy or ripple blade before, I was looking forward to trying those out. 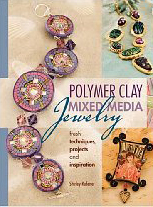 After reviewing Laurie Mika's Mixed-Media Mosaics, I decided to look into what other polymer clay mosaic books were out there. Turns out there are two good ones with the same name: Polymer Clay Mosaics by Krista Wells and, well, Polymer Clay Mosaics by Sue Heaser. While both books are out of print, they're easy to find used. I got my hands on them and wanted to let you know my thoughts. Published in 2004, Krista Wells' Polymer Clay Mosaics focuses primarily on a traditional mosaic type with tiles, traced patterns, and grout. The 21 mosaic projects cover a range of difficulty levels: from basic magnets with just a few tiles, to a large-scale tiled backsplash project. This is nice since it helps highlight how many possibilities there are. I'm really drawn to mosaics, but I've often felt they were overwhelmingly time-consuming. Not only do you have to create lots and lots of identical clay tiles, but you then have to line them up perfectly and adhere them to your background surface. And don't get me started on the mess grout can be! Still, I love the look — and when I'm in a certain kind of mood, it's worth all the time involved. 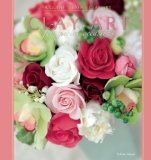 But when I got Laurie Mika's Mixed-Media Mosaics book, I realized mosaics don't have to be so time-consuming. I read her book cover-to-cover as soon as I got it (it's one of those craft books that's actually interesting to read!). I was immediately attracted to some of Mika's time-savers, like the fact that she uses a variety of tile sizes and that (gasp!) she doesn't use grout. Now that I've had a chance to try out some of her projects, I wanted to share my thoughts. Katherine Dewey's Creating Life-Like Animals in Polymer Clay book has been on my wish list for a while, so I was thrilled when my sister gifted it to me. I was even more excited when my sister, who's still new to claying and all its possibilities, hinted that she'd peeked inside and was extremely impressed. She started asking about armatures and baking time, and I thought, "Aha! A good book for converting new clay enthusiasts!" After bringing the book home and trying a couple of its projects, I too am extremely impressed with it. But I'm not so sure it's a good book for new clay-ers. "I just wanted to know if you had any advice on extruding clay using a clay extruder. I have so much trouble pushing the clay out and then cleaning it afterwards! Do you have any tips on how to make it easier?" Ugh. I knew almost without asking that Susanna was using the old silver plunger-style extruder. I knew that because I lived with my plunger-style extruder for years, and so I recognized her frustration. 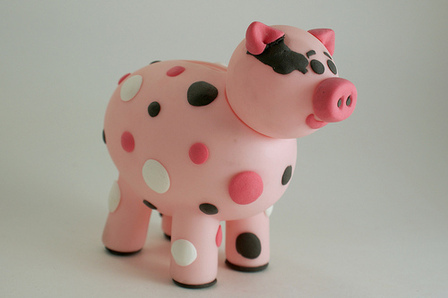 You know that sample of Studio by Sculpey clay I won from Polymer Clay Productions? The one I said all those nice things about? Well, I liked it so much I decided to buy a whole bunch of the stuff.... and boy am I regretting it now! I'm not usually an impulse buyer. I carry things around the store, trying to decide whether I really want to spend my money on them. Or I price-check every possible website to make sure I'm getting the absolute best deal once shipping's factored in. My momma taught me well. Today I'd like to talk about silicone mold putties in general, and Amazing Mold Putty in particular. Years ago, within months of using polymer clay for the first time, I took part in my first craft fair. It was a one-day show, part of a convention we were attending. I made some "pet rocks" out of polymer clay, added some googly eyes, & printed the name of the organization on an attached slip of paper. Viola! An inexpensive craft fair item. Polyform has announced that their new clay, Studio by Sculpey, is now available. Thanks to a wonderful giveaway by the gals over at Polymer Clay Productions, I got an early chance to try out a block of Peacock-colored Studio by Sculpey clay, and I have to say I'm impressed. To give you an idea of what I'm basing my comparisons on, here's my clay preference history in a nutshell. I've used Polyform products for most of my claying life, starting with Sculpey III in the early days, then switching to Premo as I learned about the difference in strength. In the past year or so, my "preferred clay" has been a Premo/UltraLight blend (approx. 2:1) because I like UltraLight's texture but find it hard to use by itself. Ahhh... the holidays. When despite all the hundreds of other things I have to do, what I want to do is create. Something about the holiday spirit just inspires me... whether it's to create something yummy in the kitchen (pumpkin gingerbread & snickerdoodles) or to create something artistic in the craft room (Christmas cards & polymer clay gifts). If you're similarly inspired & are looking to make some polymer clay Christmas ornaments, you might want to check out Maria Maestri's "Simply Ornaments and More: 1002 Designs in Polymer Clay" CD. Available for $19.95 (including shipping), this CD has step-by-step instructions for almost 300 polymer clay Christmas ornaments, plus pictures of hundreds more to use as inspiration. This CD has a nice range of ornaments, including angels, snowmen, Santas, and more (check out the Table of Contents). It also has a generous policy allowing you to sell the items you create based on these instructions. In fact, it includes a lot of good information for folks selling their work -- things like how to work production-style, how to personalize your items & make items that appeal to different customers, and how to create your own designs. Since the policy specifically mentions craft fairs and the like, I sent an email to the author asking if online sales were also acceptable.